It's not enough to save a life. Everyone deserves to have a life. “Nobody understands brain injury like Schurig Center does. At Schurig Center for Brain Injury Recovery, we make the recovery process after a brain injury or stroke more holistic and hopeful for survivors and their families. We pick up where the healthcare system leaves off, helping survivors continue their journey to recovery after they’ve completed initial rehabilitation. Our skilled staff and generous donors support a community of brave, determined, and capable people who are striving to rebuild their lives. And who just happen to be your friends, neighbors and colleagues. Connection, support, care – that's what we provide. 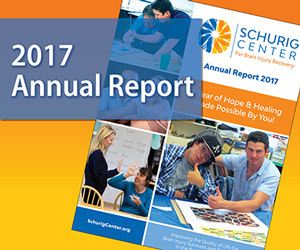 Schurig Center gives survivors and their loved ones a place to gather, to learn, to rehabilitate, and to discuss their challenges and share their triumphs. Brain injury is a pause button. Schurig Center helps survivors hit play again. Learn more about us or find out how you can support our work! My life was saved by my interactions with Schurig Center. I am only one of hundreds of people who have had life breathed back into their soul by walking through those doors. There are services for athletes who have had a concussion, but there are none for those of us who were injured outside of sports. Schurig Center addresses this need for the community. I would have fallen through the cracks of the medical system without their help. My mother's stroke didn't just happen to her, it happened to my whole family. We are so fortunate to have a resource like Schurig Center in our community.